In this blog post I’m going to share with you my exact travel packing list. 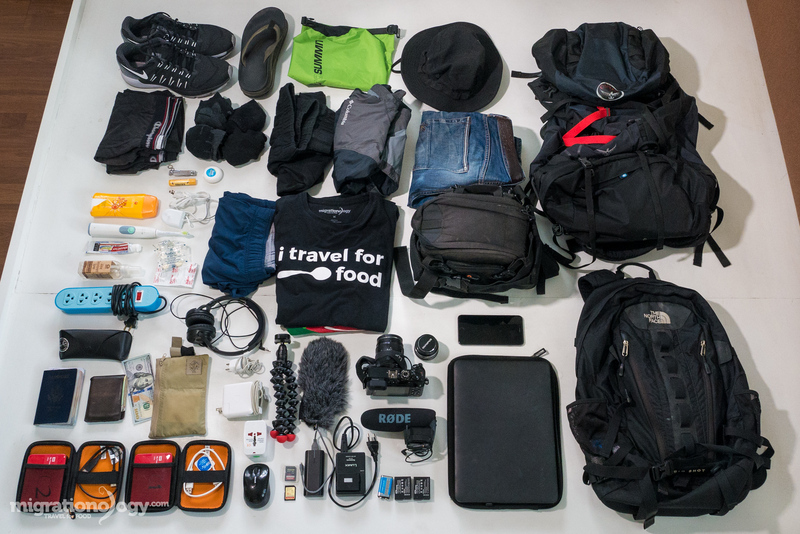 And I’m talking, you’re about to get the FULL list of exactly everything I take with me when I travel, and everything I need to run this blog, film and edit food videos on the road. I hope that by sharing my travel packing list with you, you’ll get some ideas about how you can adapt it to your specific travel needs. Osprey Kestrel 68L (main backpack) – This is a much bigger sized backpack that I use to carry stuff for both my wife and I, and we don’t ever even come close to filling it all the way (unless we are switching hotels and have a bunch of bananas and a watermelon, which we sometimes do!). We normally check this bag in on flights as well, because my wife always has some liquids. So just keep in mind that this backpack is much too big for just the stuff I mention on my travel packing list below. But before when I was traveling solo, I used a smaller 28L Osprey pack, and it was perfect. North Face Big Shot (computer backpack) – This is a medium sized computer backpack that I carry my computer and all electronics in. It makes a good carry on and I’ve been using it for years. Sea To Summit Lightweight Dry Sack 8 Liter (dry bag) – Normally I use this lightweight dry sack to carry all my chargers and some of my electronics in, which then goes into my computer backpack. Lowepro Waist Pack (camera bag) – I’m using this particular camera bag right now because I wanted to start using a waist pack to take wear and tear off a single shoulder all day (when I was using a shoulder bag). However, the Lowepro Slingshot, which was my previous camera bag, remains my favorite camera bag (I’m thinking about buying another one, I wore my old one out completely). Eagle Creek Hidden Pocket (hidden wallet) – This is one of my favorite travel accessories of all time. I normally put my credit cards, and big amounts of cash (when I have it) in here, and don’t access it frequently. 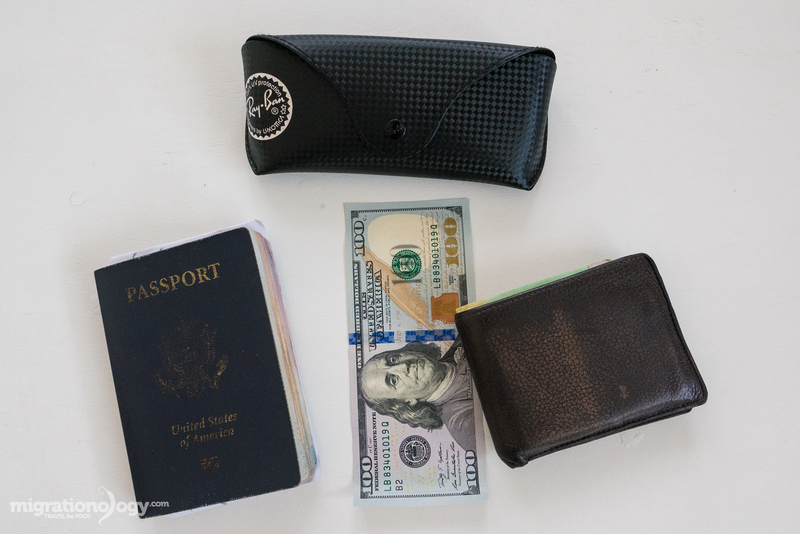 Wallet (wallet) – I have a very simple wallet that I always keep in my front pocket, and I keep daily spending money here. Panasonic LUMIX GX8 (main camera) – This is the main camera I use for everything you see on this blog. Panasonic LUMIX 12 – 35 mm lens (main lens) – This is the main lens I use for videos and photos. Olympus 17 mm (extra lens) – This is an extra lens I don’t use very often, but it takes really good sharp photos and is great with lowlight. RODE Video Mic Pro (microphone) – Main microphone I use for all my videos. RODE dead cat (wind blocker) – I know a dead kitten is a terrible name, but other than being hairy, it has nothing to do with a kitten. Slip this over your mic, and you get good audio in windy conditions. Mini plug converter (mini plug adapter) – Unfortunately with my main camera, I need a mini plug adapter to plug in the microphone. It’s a pretty easy thing to do, and I haven’t had any problems using it. Generic brand 5 extra LUMIX camera batteries (batteries) – I never want to run out of battery power when filming and traveling. 128 GB SD memory card (memory card) – I also have about 5 other random SD cards just in case, but this card usually lasts the entire day of filming and taking photos. Joby gorilla pod (tripod) – For space and ease I typically don’t carry a full tripod, but just this small portable hand-held tripod. It’s also good to use as a camera handle when vlogging. WD 2 TB external hard drives (2) – I learned the hard way to never backup on just 1 hard drive, when it crashed. Since then, I always buy 2 external hard drives at a time and backup all my content on 2 separate drives everyday, and then immediately delete footage from camera cards. MacBook Pro 13.3-Inch (laptop) – For video editing sometimes I wish I had a 15 Inch, but when traveling it’s more convenient to have a 13.3-Inch. I edit all my videos and write all my blog posts on this laptop. Speck Case for 13-Inch MacBook (protective laptop case) – I don’t like how this plastic case makes my laptop bigger, but it’s definitely prevented my laptop from lots of scratches – it does its job very well. Amazon Basics Computer Sleeve (laptop sleeve case) – Simple laptop sleeve, but I like it because it’s not bigger than it needs to be. Microsoft Wireless Mouse (mouse) – This little mouse fits my hand perfectly, and I think it’s the perfect size and weight. Couldn’t edit videos without it. Amazon Basics Headphones (headphones) – These headphones are affordable so you don’t need to worry about them, and they sound pretty decent. iPhone 6 plus (phone) – This is my current phone that I use to handle all my social media and mobile things. TEP mobile wireless (internet device, not pictured) – I bought this mobile wireless internet system and used it mostly traveling in Europe, but it works in many countries around the world. It’s not cheap, but it’s very helpful when you need internet like I do. Universal travel plug adapter (universal plug) – This is always good to have so you don’t need to worry about the plug type in any country. Power strip (power) – It’s amazing how so many hotels only have a single plug, and I usually need to charge about 5 things at a time, so I just choose to sacrifice and always carry a power strip on my travel packing list. Battery bank – You burn through your phone battery pretty fast surfing the internet, so a battery bank is very helpful. 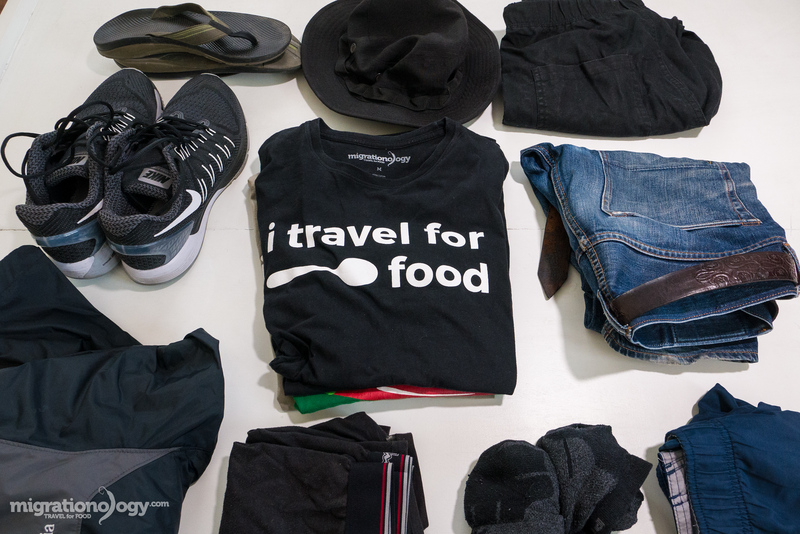 Unless you need specific location clothing, you don’t need too much clothing when you travel. For clothing in this travel packing list, you really need to adapt it to your own needs. These are exactly the clothes I typically travel with, but decide for yourself how many extras of everything you want to carry. And also, for this clothing section especially it’s just a guide, because you always need to adapt to the climate or place you’ll be going (Ex. if I was traveling somewhere cold I’d need a big jacket). Jeans (1) – I wear just one pair of jeans that I buy from my friend Ben who makes custom jeans. Lightweight pants (1) – I usually carry a very lightweight pair of pants, for cooler weather or when lounging around and want to avoid mosquito bites. Gym shorts or Swimming shorts (1) – I sometimes bring both, or one that doubles as both. Walking shorts (1) – Depends on weather, but I also usually bring a pair of walking shorts. Belt (1) – I bought a leather belt in Argentina in 2008, and I’ve been using the same belt ever since. T-shirts (4) – I normally wear all my own t-shirts, that way I never need to decide what to wear! Lightweight rain jacket – This is what I carry with me most of the time traveling in Southeast Asia, but when I travel somewhere really cold, I also have a much warmer Colombia jacket. Socks (4) – Right now I’m wearing some Puma socks. Underwear (4) – I usually wear Champion, but ExOfficio are pretty good too. Walking / running shoes (1) – Right now I have a pair of Nike Air Zoom Odyssey and they are supposed to be really good for your feet. They are pretty comfortable too! Light flip flops (1) – Not sure yet if I’ve found the perfect one yet, I’ll link it here when I do. I have a pair of Chaco flip flops, which offer really good foot support, but they are too heavy. Goofy sun blocking hat (1) – A cap will also do, but head protection is very necessary sometimes. I have a Colombia floppy hat, and what I like about it is completely squish-able / foldable. A quick note on laundry: My wife and I never bother with taking the time or effort (or expense) to do laundry when we travel, but instead we wash our clothes in the sink of our hotel or place we’re staying. It’s so much cheaper, faster, and easier, and only takes a few minutes every day. Electric Toothbrush – My Dad recently persuaded me to buy an electric toothbrush, and I did and haven’t looked back. It’s not light to carry around, but it works well, and I like it. Toothpaste – I use whatever toothpaste my wife buys for me. Floss (my favorite) – I’m a flosser, if I don’t floss I don’t feel like my teeth are clean. Deodorant – I like the idea of natural deodorants these days. Sunscreen – It’s a good idea to use sunscreen on a daily basis, especially if you’re traveling outdoors all day. Nail clippers – A great thing to always have on your travel packing list. Anti acids – Usually keep a few anti acid tablets handy just in case. Tylenol – I don’t always carry medications, but sometimes I have a few things like Tylenol. Note: When it comes to toiletries, just about everything I ever need is available in the country / city I visit, and so I don’t worry too much about other toiletries like shavers, even toothpaste, or other essentials. If I happen to run out, I get a local version wherever I am. Sunglasses – Optional, but well worth it. Passport – Make sure you have pages and that you’re passport is still valid for over 6 months. Copy of passport – It’s a good idea to make a copy of your passport to carry in a different bag from where your real passport is, just in case. ID card – I always carry my driver’s license. Credit cards – I mainly use a Chase Sapphire credit card. Debit cards – The main debit card and bank I use is Charles Schwab. They will refund your international ATM fees each month. $200 cash – This is not exact, but I do like to carry a few hundred dollars in cash just in case of emergency. I’m not an ultra light minimalist packer, but at the same time I carry a concise amount of things because I know how much more comfortable the travel experience is the lighter your bag. My general philosophy for any travel packing list is to carry the things you need to be comfortable with and have the tools you need to create what you plan to do, and that’s it. Hope this travel packing list helps you when you’re packing for your next trip! Also, check out my Resources Page for more tools and resources I use. Note: Many of the links on this page are Amazon or other affiliate links, meaning that if you make a purchase, at no extra cost to you, I’ll earn a small commission. 82 comments. I'd love to hear from you! Thank you Mark for sharing this, but you forget one thing! a drone! you used it in many videos like the one you took from Gisenyi, Rubavu Rwanda. I was wondering what you use to stabilize your camera ? 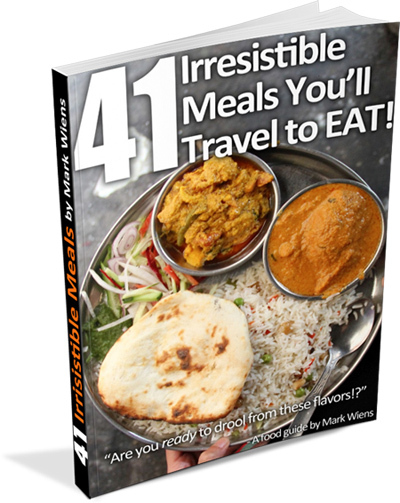 Good luck, and all the best for you Mark Wiens, our favorite food vlogger! I love packing list blog posts!! Travel packing is an art form – it takes a bit of practice! Thanks for sharing! 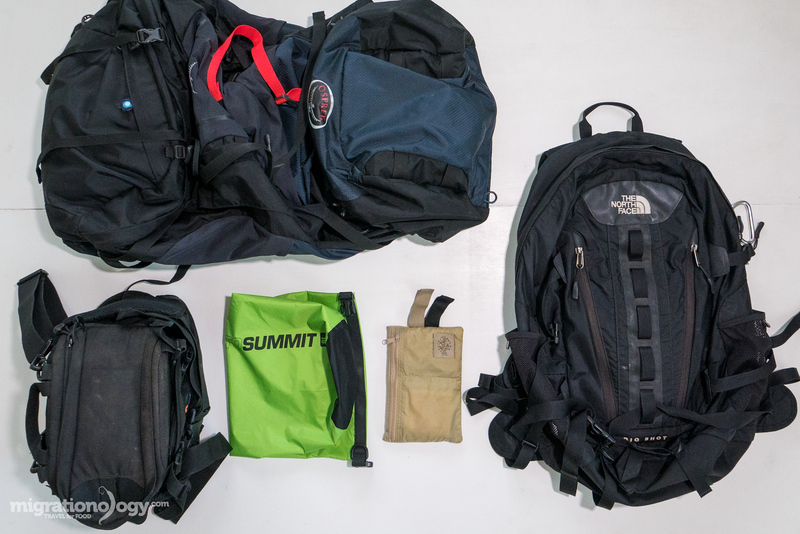 This is the ultimate packing list! There’s so many things which are so simple, and would make my travel life so much easier, but I’d never even considered – the power strip being the main one! On my last trip, my boyfriend and I were constantly having to juggle charging our electronics (two phones, two cameras, and a vape) with one socket and one plug adaptor. Thank you so much!! Your vlogs have always been so steady because of Joby Gorilla pod? I am your latest fan on earth. Keep it up Mark!! Wow!! Looks like you are taking the whole stuff along with you. I felt very excited when i saw the photos of your travel belongings. Dear Mark, I have become a fan of yours and your exciting work. Always clean reviews of every place you visit. You can really feel the enjoyment of a meal when watching you eat. Put Ixtapa, Zihuatanejo in your travel plans when coming to Mexico, much rich culture and delicious and exciting dishes to enjoy. I think it would be a great place to visit and review. Great work!!! It’s great to see how you travel. Good to know how an experienced traveller pack a bag. I have already got some tips for my next travel. Thank you for the informative share. It’s weird but I do use an electronic toothbrush at home all the time but never thought about bringing it to my travels. I usually bring one toothbrush and if needed buy another one at the destination. Thanks for the suggestion of making a copy of the passport. Have never thought of that either. Thank you for the list. TEP mobile wireless is actualy too expensive for me. Wow, it’s always interesting to know how other travellers, especially bloggers, organise their bags. I know I really have to buy a tripod as my local friends in India sometimes shoot and are not so happy with the move. I always try to reduce weight but I agree with you when you say it’s better to have the essentials. As I travel mainly to India now, that means I need my own sheet – often they don’t provide it and they don’t wash the blanket each time… + daily contact lenses to avoid an eye infection with dirty contact lenses. Great guide. We have travelled frequently and still do not have the art of packing down pat just yet however getting more experienced with this. I would also like to add that we always carry Elastoplast Classic Tape, as it has so many uses. It is great when travelling with children as they always need a band aid for minor cuts and blisters. The tape is strong enough to secure bags if zippers break the tape is easily torn by hand. I love packing lists! Particularly the technology stuff 😀 Thanks! I’m a terrible packer and always end up taking way to much stuff along, most of which sees little or no use. I am very impressed hearing that you used to carry a 28L backpack! There is a reason we don’t have any packing lists on our blog 🙂 Thanks for the inspiration! This a great and extensive list! I also carry antacids (tums) in a tiny travel size container because you just never know! 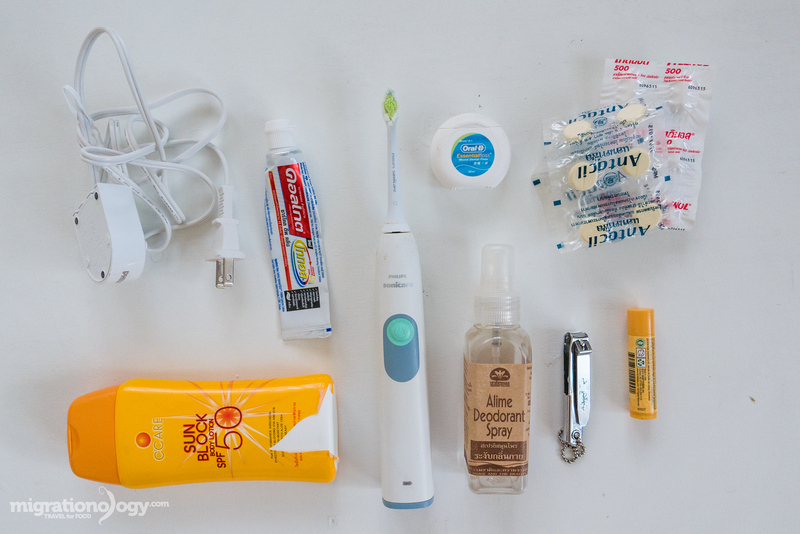 I’m a minimalist backpack only traveler and your toiletry set up has got me second guessing my method! I wanna travel someday as well. I’m pretty jealous of you. You deserve to be the best. I wish you and your wife a gorgeous and successful life. By the way I’m from Saudi Arabia and I want you and your wife to visit my country. Very helpful in guiding what I pack for my family trip to Europe this summer and in the future! Thank you for putting your own packing list on here! It really helped.???? Nice list,t you pack your electric toothbrush too. I thought i was the only one!! Also this the $200 cash tip has saved me countless time! Great packing list you have there. Thanks for sharing this, really helpful. I will definitely check out the items you listed (especially the electronics stuff) and see what we can add to our own packing list. Such a great list, and it’s great to know I’m not the only one toting so much stuff around. I’ve tried to pack lighter but always regret leaving stuff behind. Also so glad to hear you’d still recommend the Lowepro Slingshot! It’ll be my new investment. Thanks, Mark! hello. i really love your videos on the yourtube. i wanna ask something. does a camera man accompany you? i can feel that one camera man film you while you are eating. secondly. i think the gorilla pod is not enough long to film you especially when you see the camera on the table. i believe it should have had more longer legs unless you don’t have any camera man. also how do you film the scene when you eating and siting at the same time on the street? i think you need to have longer camera pod unless your camera man accompany you. Thank you for an informative blog. Great tips for travellers, this blog is like a blessing in disguise. Thank you for this great packing list. I’m especially interested in your camera/tech section as videoing my travels is something I’m looking to get into and helps to see what other people, like yourself use. Thank you. 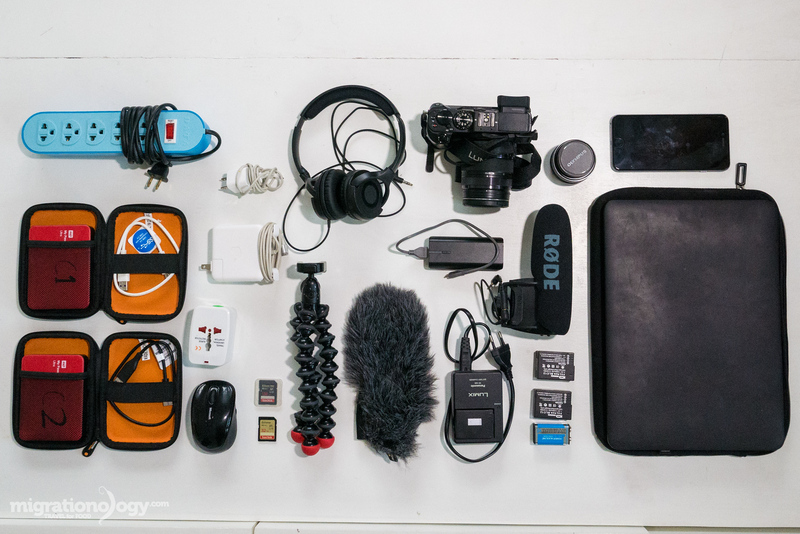 Great list, really appreciate you showing us what you pack when you travel. Have you ever found the need to take a scarf or sarong with you on your travels? I’ve found that it has come in handy for me on many occasions while travelling Asia! I love it , Great examples ! First and foremost thank you for taking the time to share your experiences with the world. My wife and I came across your channel/site last year when planing our Tokyo trip for our 4 year anniversary and have been following you since. This year for our 5 year anniversary we are backpacking through Seoul, Bangkok and also Hong Kong all thanks to your vlogs. If possible, I would love to know you top 3 places to eat in each location. I am a big meat eater and my wife is more of a seafood/veggie eater. Keep up the great work! Hey Maick, thank you, hehe, not quite all the time, but I do like to be as organized as possible! Nice list. Osprey is my favourite backpack, although I trekked the Annapurna Circuit with a Vango Sherpa before I got my Osprey and found it okay but not near as good as the Osprey. I also like the MacBook Pro, and had one of them also (2nd hand) until I spilled a whole cup of hot tea over it and killed it; I’ve now been relegated to a Dell Latitude, but I’m coping. I’ll be replacing the MacBook when I have the funds. Good post, Mark! Hi Vera, you’re welcome, glad this packing list is helpful. “My general philosophy for any travel packing list is to carry the things you need to be comfortable with and have the tools you need to create what you plan to do, and that’s it.” –> agreed. Sometimes I carry more stuff than I’d like to, but it all depends on what I’m gonna need for the trip. I always try to avoid checking in luggage to save time and minimize hassle, but sometimes it’s unavoidable. Hi Vira, good to hear that. Before I got married, I also used to travel most of the time just with a hand carry, but since getting married and my wife has a few toiletries normally, we usually check a bag. Sometimes i just couldnt’ prioritize what i should bring. I believe everyone want their carry as less as possible, and after read your article i think i know what to bring for my next travel. Thank you so much! Hey Susan, I’m so happy this post has helped, thanks for reading! Will you go to USA? Which state would you go to????? Hey Abdu, my wife and I recently just spent a few days in NYC, but other than that, haven’t done too much in the US. Hey Pat, thanks for looking out, will edit that immediately. This is awesome. Do you have to check the bigger bag usually? Is there a Ying’s version or is she similar?? I’d love to see her version, too! Hey Mark, when are you coming over to KL again? 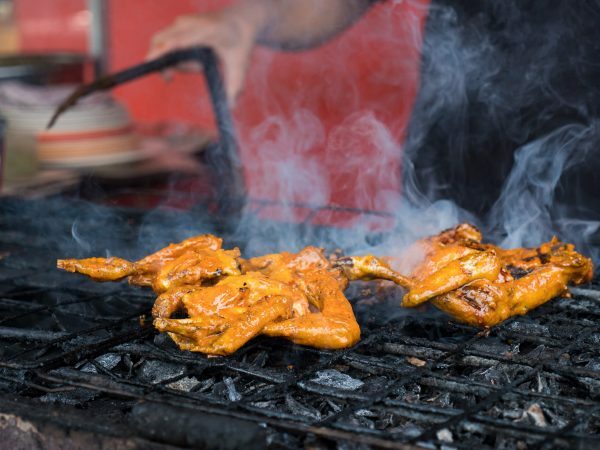 I can show u some great food places around the suburbs part of KL like Petaling Jaya, Cheras, Kajang and Kuala Selangor! One question: How do you keep fit while eating all these delicious food around the globe? I follow your blog for a while and I must say that this is one of the most informative articles for digital nomads like me (I think I’m not the only one who thinks that). When it comes to packing we are quite similar. I also don’t pack as many clothes and use local washing services whenever I can. The two things I can’t travel without are my laptop and my Kindle eBook readers. I would be screwed without them. Anyway, thanks a lot for this article. i really appreciate it. 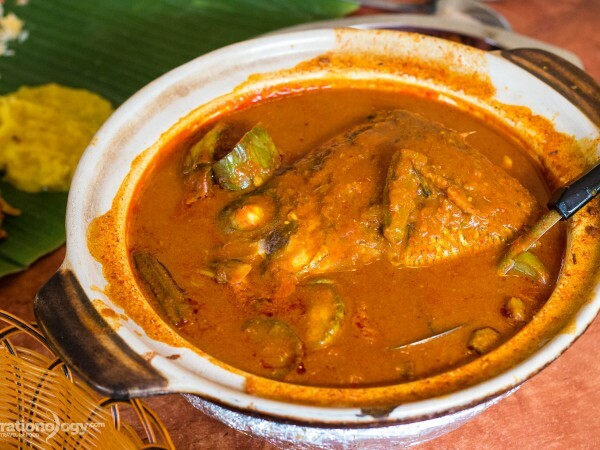 As new blogger on food. As u can see. May focus more on MALAY n HALAL food. You should do a cooking channel recreating the dishes ypu eat. All things are most important in travel. Thanks for update this lists for all traveller. I like this common sense planning. Im a professional journalist/broadcaster (freelancing these days) and I can certainly vouch for leaning towards the minimal! I’m inspired by your vlogs and im planning a new one myself at the moment that has to do with food/travel and gets a bit more into culture and how humans around the world can connect with each other by finding common ground. Hi Angelino, thank you very much for reading this travel packing list. Great to hear about the new channel you’ll be starting, keep me posted. Would love to check it out. Thanks again for your support. These days I would also recommend RFID sleeves for cards and passports. They are cheap and give some peace of mind against skimming and identity theft. Hey Eric, good idea, thanks for sharing. It was great reading this as it is helping me make sure I pack the right things for my next trip. Have you ever considered an external SSD hard drive? They are a bit more expensive than a mechanical hard drive but can take shocks so much better! Hi Barry, thanks for reading, glad this is helpful. I have thought about SSD hard drives, but I think at the moment it’s not cost efficient. Right now I’m buying 2 TB external drives, and 2 at a time, and I go through about 8 per year or so, depending on how much I travel, so that would really add up with the SSD. But hopefully they will come down in price in the future. Thanks for sharing! Hey Andy, thanks for reading and for your added input. 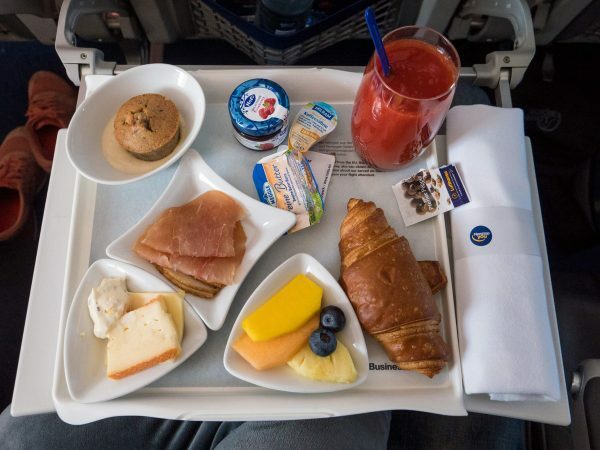 That’s a great idea about the change of clothes in your carry on, and I especially like you idea about water and a snack to see you through the nigh! Hey JB and Renee, great to hear from you. Haha, glad you started carrying a power strip as well. It’s so well worth the space! 1. Do airlines allow nail clippers and beard trimmer in hand baggage? 2. If your jeans is dirty or wet and you need to wash it. What will you wear that day? 3. if you get chance to go royal family dinner or party.. you will wear those round neck T-shirt or buy new clothes? Thanks for sharing your travel packing stuff with us. Hey Avnish, you’re welcome, thanks for reading. 1. I haven’t had a problem with nail clippers in hand carry over the years, but normally my wife and I always have a checked back due to a few liquids, and so most of the time, just because the nail clippers are with the liquids I check it. 2. I don’t wash my jeans often, but usually I’ll wear the lightweight pants as a substitute if I need to. 3. On the occasion that something like that comes about, I will go buy a nice shirt, or whatever is appropriate for the situation. Hey Melanie, thank you very much, awesome to hear that you’ve refined your packing list. Blow up pillows are a great idea, and thanks for sharing your extra essentials as well! What do you sleep in then, Mark? I need a separate set of sleeping things because I’d hate to sleep in the same sweaty and dusty t-shirt and shorts and I’d been walking around in all day. Hey Manu, that’s a good question. I normally take a shower at night, change into new underwear, and sleep in my underwear. I prefer to carry a cotton sleeping sack. Some people don’t like them but it insults you from nasty beds and MOST IMPORTANTLY… from hungry bed bugs!!! I had some really bed experiences in my time but have had no problems since using the sack as they can’t get in! Hey Anita, thanks for sharing your thoughts. Always trade-offs about packing and what you bring with you, but I think the important thing is to balance what you’ll be comfortable and have the things you need or want to do what you want to accomplish, and then reducing enough to be comfortable carrying everything you have.